Chang Jui-chuan, a Taiwanese native, is a college lecturer of English composition who self-released in 2006 his first hip-hop album, Genesis. While politically and historically charged, the themes in both of his Taiwanese and English lyrics can be easily traced back to the roots of justice, freedom, and true brotherhood. His first remix album Resurrection (2007) is called by Indie-Music.com (USA) “best Taiwanese hip-hop album of the year” and compared to The Roots’ work. Chang is currently pursuing a doctorate in language education and has released his first collection entitled Exodus (2009) under ULoud (Chthonic, Sugar Plum Ferry, Fire Ex) in Taiwan. 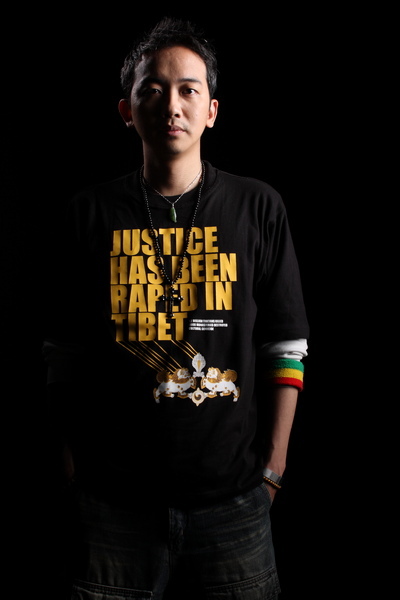 This album, featuring Lim Giong, MoShang, and Red-I & the Riddim Outlawz, includes “Freedom Zen,” the world’s first single that bravely announces support for Tibet’s independence. [攏不知] 排練: Have mercy on me, O Lord!